As some of you may remember from my egregious posting of many white pony pictures on instagram, I was in Ireland earlier this fall for a wedding. The country has historically gotten a pretty bad rap for its food scene (even more so than its weather). So I went into the trip knowing that my main adventures were going to be in the saddle rather than at pub. (Well, at least during dinner hours). That said, I’m a total sucker for classic pub food. Before I became gluten-free, I could eat my weight in Fish and Chips. It was hard for me to be a passive bystander as I watched my friends wolfing down crispy haddock on newsprint. But the other menu offerings weren’t half bad – in fact, some of them were down right creative. On Thursday night, the only people who’d arrived were family members and nerdy horse enthusiasts like me, so we went out for an amazing meal at Vaughans Anchor Inn. You can see some of the creations here, posted as mere filler between pony shots. I had quail and venison, with a smattering of chips stolen from the aforementioned newsprint bundles of anyone who wasn’t looking. I got my fish fix the next night at the rehearsal dinner, since my friend Whitney is the most considerate bride on the planet and requested a gluten-free version for myself and the other glutards. The meal was served family style and my gluten-free Fish and Chips was similarly portioned to the platter that the rest of the table received, once again proving my ability to eat my weight in fried food. The one dish I didn’t get my fix of in Ireland was bangers and mash. Perhaps it’s fallen out of favor as the pubs have stepped up their game. But I came home craving old school sausage and potatoes. 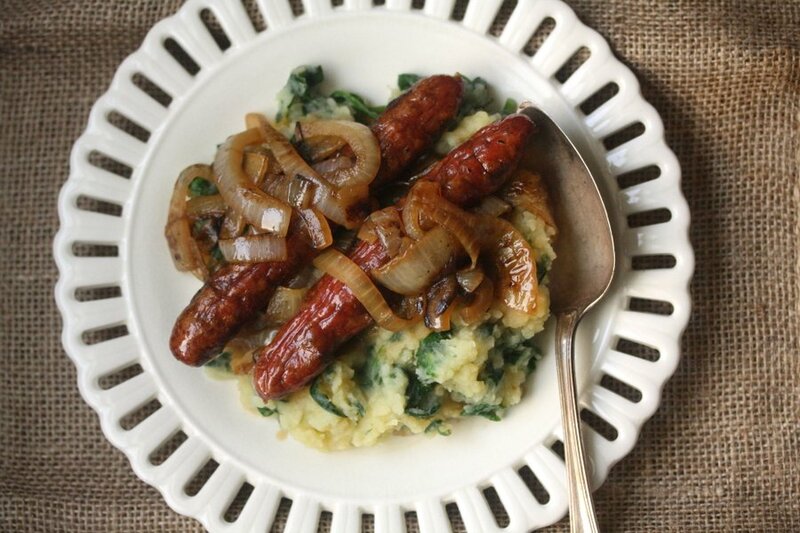 Since St. Patty’s Day is on the horizon, I thought it was the perfect time to introduce my bangers and mash recipe on the blog. 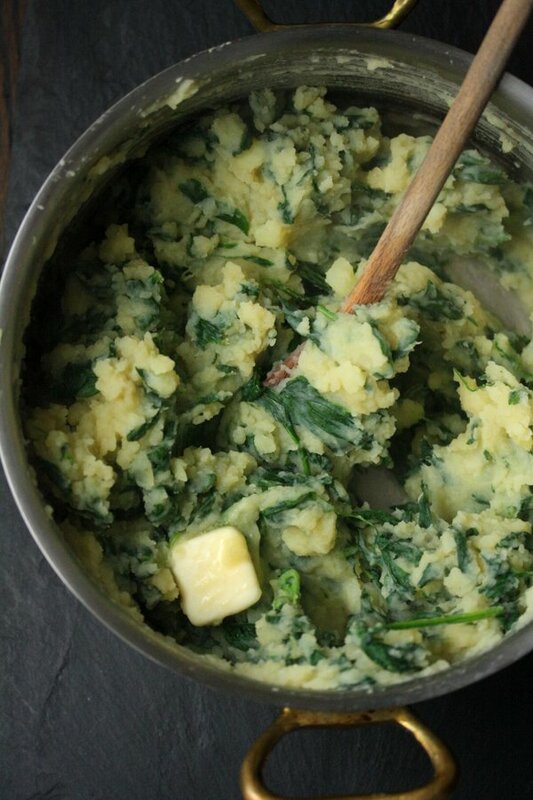 I healthified it slightly by adding wilted spinach to the mash, which is something my mother always used to do. Sometimes, even when you don’t use dairy, I find mashed potatoes a little cloyingly rich. The spinach adds a great body, and together with the bangers, makes this dish a perfectly balanced meal, no side salad necessary. Another thing I consumed my weight in while in Ireland was hard cider. They make it so much dryer and more complex over there – even the commercial brands. 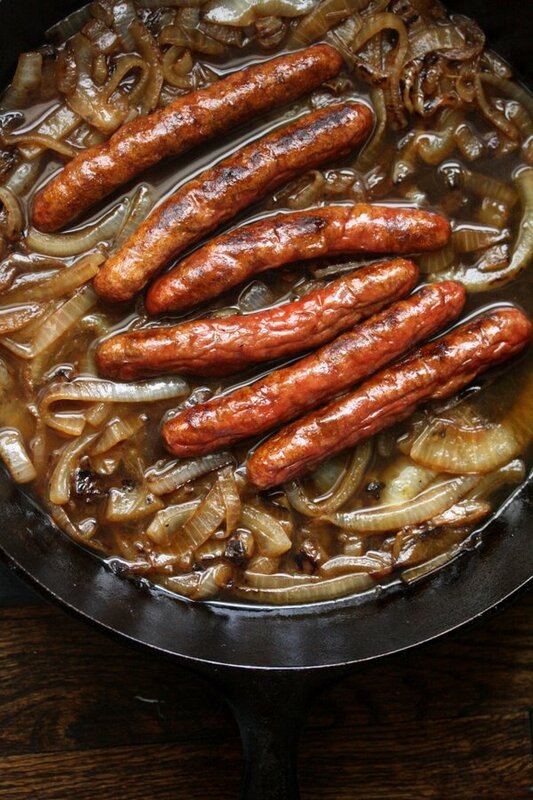 I used a bottle of Magners to deglaze the sausage skillet and add a nice sauce to the onions. When it reduces down, due to the hint of sweetness, it needs little else to become an excellent pan sauce. 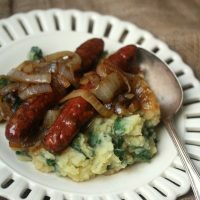 Regardless of whether or not you celebrate St. Patty or embrace Irish pub food on a year-round basis, as I do, this bangers and mash recipe makes for a great easy weeknight meal. Don’t forget to buy a couple extra bottles of cider. p.s. If you want to see pictures from the wedding, it was featured in Vogue! p.p.s. Don’t forget to tune into today’s Wellness Wednesday chat at noon! i know!! she’s truly the best. I loved every bite. clearly. 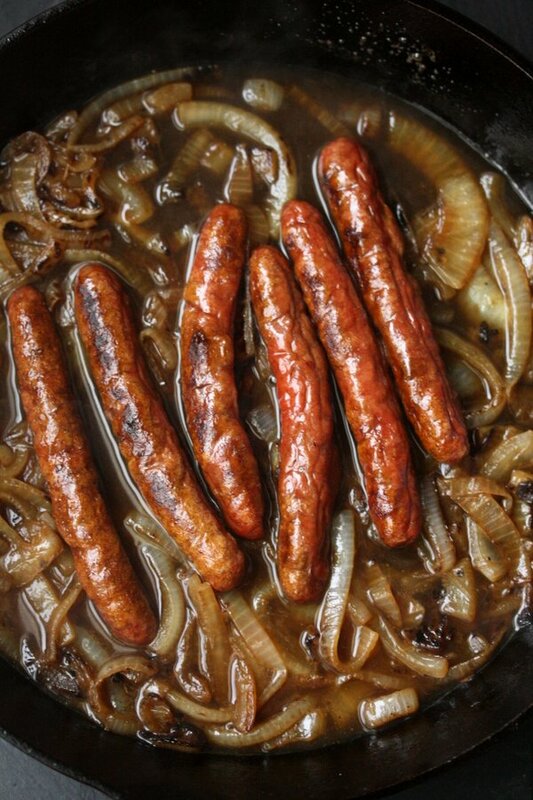 Are the Brits’ bangers flavored the same as our breakfast sausages? Or do they have a taste of their own? Just wondering what’s the closest in taste. you know, i have no idea. 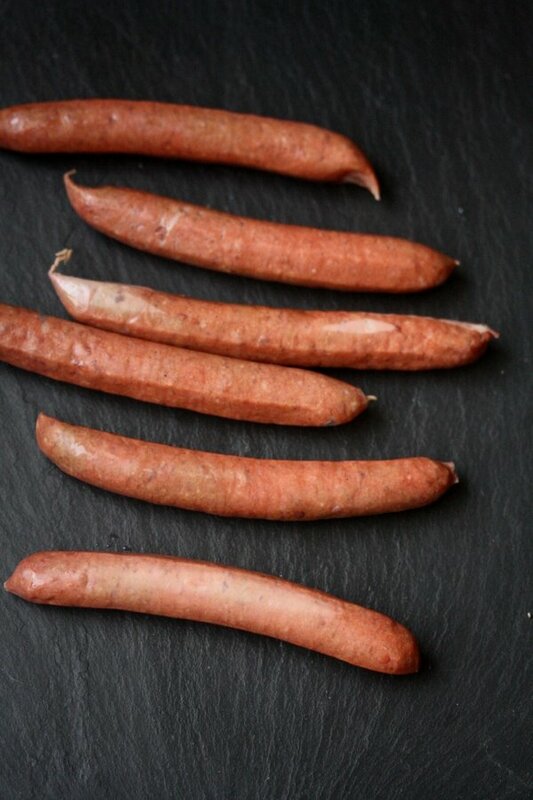 Breakfast sausages seem to be closest in size, versus the massive sausages you find fresh in the butcher case. OMG woah! This sounds soooo good! I absolutely LOVE that you added spinach to the mash! YAY! 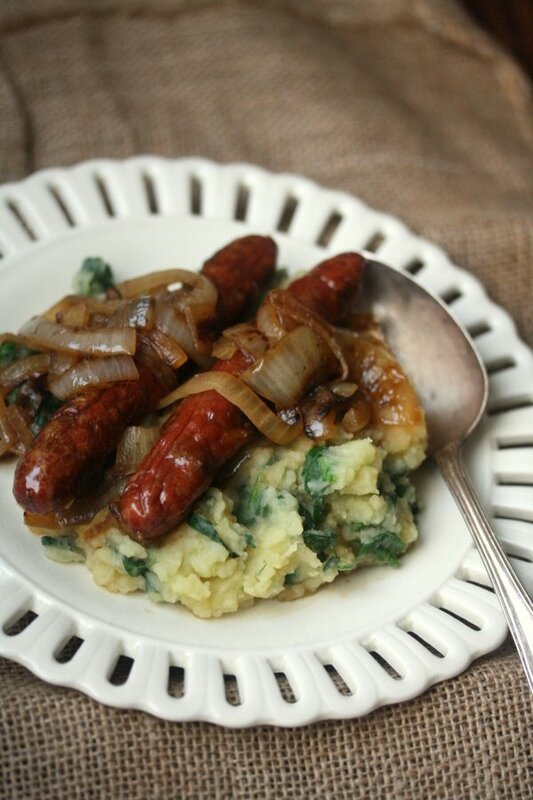 I made a bangers and mash recipe on my blog this week and I used beer for the onions! MmmmM! By the way Patty is a nickname for Patricia, a female name. St. Patrick was a man 🙂 Paddy is the best way to shorten the name. ahhhh my terrible spelling abilities strike again! Thanks Kerri! Will definitely check out Colcannon. Where are your parents from? I was in Clare. You’re welcome! My parents are from Kerry and Mayo. I have an uncle in West Clare so I’ve been there a lot too. 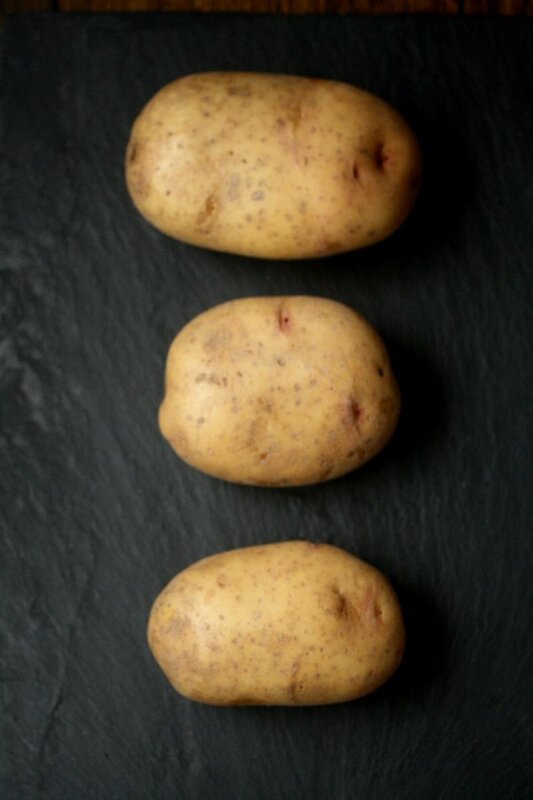 Ooo the colcannon looks so good too. I’m a sucker for potatoes (though I can’t do milk alas) and I love the idea of leaving a hole for melted butter. Hi Kristen – Yes I’ve heard this as well! But that’s mainly for people with gluten sensitivities. Anyone with celiac or a more serious allergy will experience the same issues. I tested it out when I was in Spain earlier this year and still had a terrible reaction. It was worth it perhaps for the fried squid. But now I know that it’s really a gluten issue for me, not just GMO flour + the quick rise we give bread here. Indeed it is Paddy’s Day not Patty and the sooner Americans learn this the better. Thanks also for not doing bacon and cabbage. I made this last night and it was fantastic! 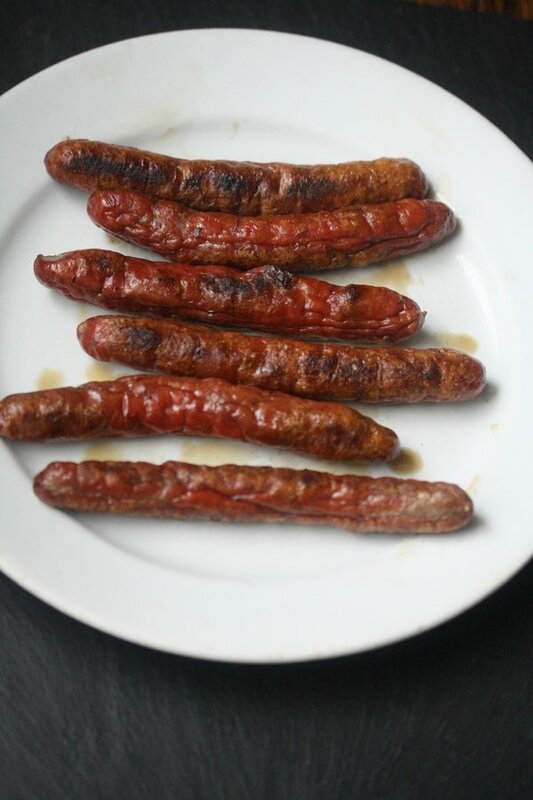 I used Trader Joe’s Irish Bangers. My 2 1/2 year old son gobbled it up too! Looks so good. I think I would add some of the banger grease to the potatoes to really pump it up.